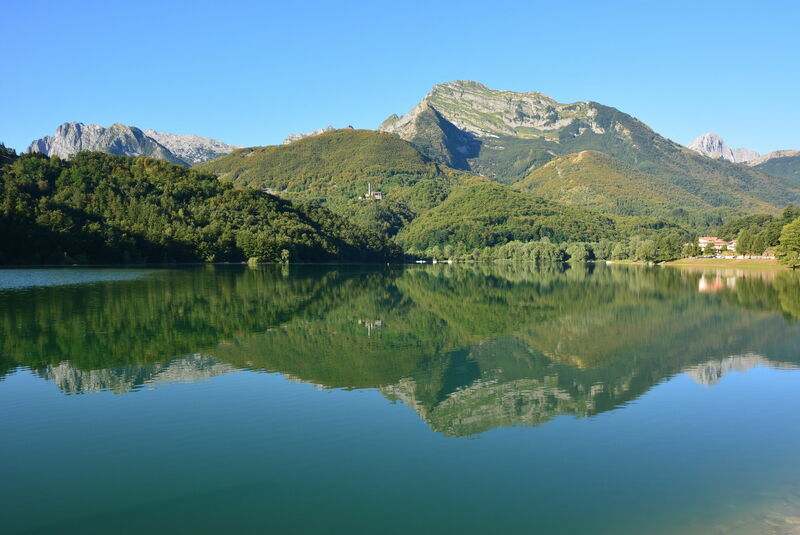 Most of the vast Minucciano area is sheltered by the Apuan Alps Regional Park, home to some of the highest peaks in the local marble basin. The considerable extraction of the stone, typical of this part of Tuscany, began to expand exponentially in the early twentieth century, although knowledge of the quarries’ existence dates back more than two centuries. The lack of roads leading to the Minucciano quarries long hindered further expansion of the mining here, but the building of roads at the turn of the century encouraged emigration from the valleys between Garfagnana and Lunigiana in addition to the trading of the marble. Visiting the stunning mountain scenery yields opportunities to go hiking along scenic trails through woods and alongside the purest streams. The history of the Minucciano area began with ancient Ligurian and Apuan peoples, revealed by the unearthing of countless archaeological remains. The stele statues are the most interesting of these relics: bronze-age menhir, copies of which can be viewed in an archaeological park near the Minucciano Hermitage. The area was later populated by Romans and Longobards. For centuries disputed by local powers, during the Frankish occupation Minucciano (which would seem to have taken its name from the Roman consul Quinto Minucio or from the Latin Praedium minicianum) was a feud of the Malaspina family until it became independent and obtained the right to make its own currency, the Barbone Minuccianese, the equivalent of one-third of the Scudo Lucchese. Towards the middle of the fourteenth century the area was surrendered to the Florentines, under whose rule it remained until 1369 when it returned to Lucca once and for all, which make Minucciano into its own vicariate. The hamlets of Gorfigliano, Gramolazzo, Agliano and Castagnola were united with Castiglione, whose sovereignity was suppressed in 1818, when all the areas were annexed with Minucciano again, forming the extended administration that still exists today. A line of hills divides the municipality in two, Garfagnana area and Lunigiana, at whose centre, perched on a rocky spur, stands the town of Minucciano with its centuries-old medieval castle. Many local traditions live on in the area, such as the spectacular Natalecci bonfire in Gorfigliano, with its church and castle tower (documented in a 793AD Frank/Longobard document). Among the attractions worth visiting are the Minucciano Tower (part of the castle, partly destroyed during the 1837 earthquake), the Annigoni Crucifix, in the Pancetti chapel of the Gorfigliano cemetery, the church of Pieve San Lorenzo, the thirteenth-century Pugliano church, the twelfth-century Romanesque-style Castagnola church and the Beata Vergine del Soccorso Sanctuary, with the archaeological park. Planning a trip to Minucciano means checking out all the fascinating local folk events organized throughout the area, including the nativity play at Christmastime and Natalecci on Christmas Eve, a competition between Gorfigliano and Verrucolette to light the biggest bonfire. Another popular event is Canto del Maggio, an epic play in the woods and squares of the town, and the splendid Wheat Festival. On August 15, head to Pugliano for the Palio dei Micci, a popular local contest.